Palliser's founders knew they wanted to make good wine, but where does it all start? Palliser Estate's environment allows them to grow outstanding grapes to create magical wines. Palliser take pride in the care of their vineyard soils by encouraging diversity of plant life. The winemakers minimise spraying and use only friendly sprays where possible. Caring for the environment started as a notion, now it is an ethos. The quality of the Palliser grapes are acknowledged as among the best in New Zealand. Locals say that Martinborough is the best place in the country to make wine. Winemaker Allan Johnson is first to agree and reels off the reasons: soil, water, and air, the three natural elements essential to making quality wine. Reliable dry autumns increase the intense flavours, and low cropping levels are produced by cool windy spring weather. Low cropping levels and undiluted flavours tend to create the essential ingredients of power and concentration from which fine, and even great wines are produced. Martinborough is one of the few areas where this situation is naturally imposed by the weather. Palliser produces two labels that are recognised around the world for quality, Palliser Estate and Pencarrow. The Palliser Estate wines are a strong and distinct premium portfolio, whilst the Pencarrow range is in a different style, and offers very approachable wines of excellent quality. Palliser Estate's wines are served in some of the world’s finest restaurants, enjoyed by thousands of people every day and savoured by international passengers travelling the world with airlines such as Air New Zealand, Cathay Pacific, Lufthansa and KLM. Palliser firmly believe that they are responsible for the care and management of their environment. It is the unique combination of soil, air and climate that allows Palliser to grow such outstanding grapes for their wines. Palliser Estate have an environment management system throughout the company that ensures that everything the winemakers do is considered on its environmental impacts. Palliser Estate have introduced a new system that re-uses the winery's wastewater for irrigation. The wines are in recyclable or re-useable packaging. Palliser owns 90% of their own vineyards and invest heavily in viticulture to produce a great product. To date that investment has been paid off by the production of world class wines. Palliser is proud to be innovative in their approach to environmental aspects. In 1998 Palliser Estate Palliser were amongst the first wineries in the world to be certified to the international environmental standard ISO 14001. Palliser Estate are part of the Living Wine New Zealand group www.livingwine.org.nz, a group of wineries all certified to ISO 14001 and dedicated to continuous improvement of their environmental systems. 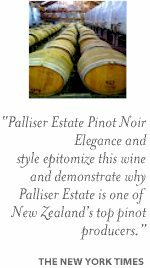 Palliser grow the varieties of Pinot Noir, Chardonnay, Riesling, Sauvignon Blanc and Pinot Gris. These are grown on the various estate vineyards - Palliser, Pencarrow, Om Santi, Pinnacles and Clouston, which are all on the renowned Martinborough Terrace. The Palliser winemakers have found that even over this relatively small area, there are great differences in soil types and climate which all help to add complexity to the wines.